A drink-driver lost control of his vehicle and crashed through a hedge at a house and into a driveway. Chesterfield magistrates’ court heard how James Emerson Parkes, 36, of Burlington Avenue, Langwith Junction, lost control of his vehicle on Recreation Road, at Langwith Junction, as he was making his way back from a shopping trip. Mrs Allsop added that following a positive roadside breath test the defendant said he had been “really stupid”. 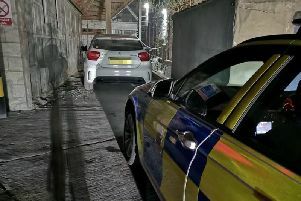 He told police he had been at a friend’s and had consumed two or three cans of Stella Artois lager or more and he had walked home but his wife and children needed something so he drove to the shops but on the way back he crashed into a hedge at a house and a driveway. Parkes pleaded guilty to exceeding the alcohol drink-drive limit after registering 99 microgrammes of alcohol in 100 millilitres of breath when the legal limit is 35 microgrammes. Defence solicitor John Wilford said: “He’s completely remorseful and he’s been absolutely co-operative with the police. Magistrates sentenced Parkes on June 27 to a 12 month community order with 80 hours of unpaid work. He must pay an £85 victim surcharge and £85 costs. Parkes was also disqualified from driving for 24 months but the ban can be reduced by 19 weeks if he completes a drink-drive rehabilitation course.